← Hydra: donkeys and cats and goats, oh my! In the US, we eat Greek salads. They usually have lots of lettuce, a few bits of tomato and cucumber, an olive or two, red onion, and some crumbles of feta cheese. 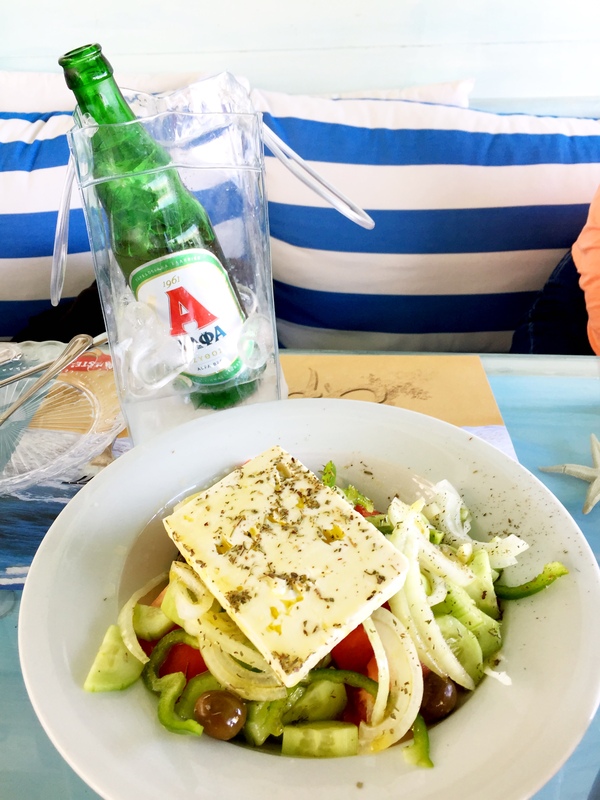 Here in Greece we eat GREEK salads. Where’s the lettuce? 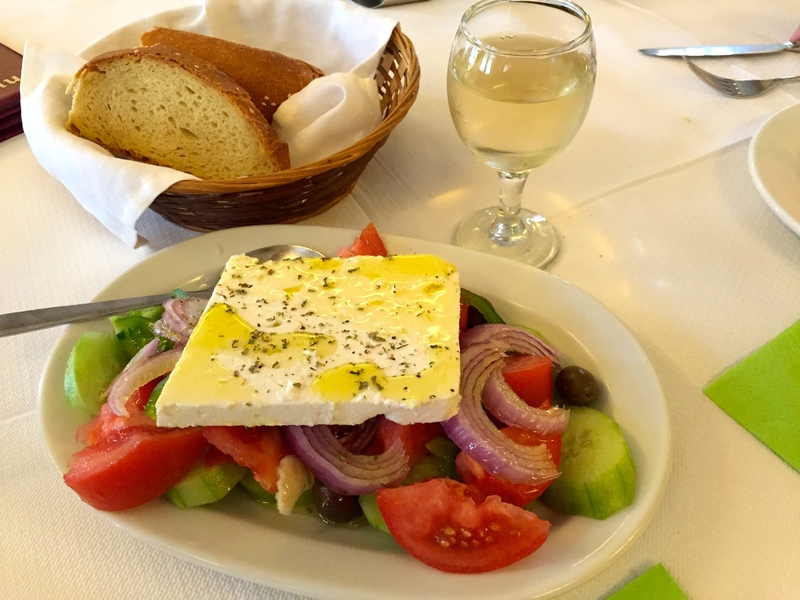 A GREEK salad doesn’t have lettuce! It has tomatoes (lots of them! ), cucumbers, peppers, olives, red onions, capers, feta cheese, lots of olive oil, and oregano. We ordered the salads with white wine, no winery identification or even type of wine, just white wine, bulk or barrel. And it was good, light and dry. White wine and crusty bread add a nice touch. It seemed like the amount of feta got bigger and bigger with each salad. And lots of olives and capers! Did we say LOTS of feta? There wasn’t a lot of variation (Why mess with success?) One had yellow peppers instead of green. One had white onion instead of red. A couple had no capers. (What? No capers in my Greek salad?!) The olives varied most of all, from Kalamata to green to very briny brown ones to speckled. Mostly the feta got bigger and bigger. This one was solid tomatoes under the huge amount of feta. Probably three or four tomatoes in one salad. And we varied our drinks too. White wine of course. This was the only salad served with pita bread. There is so much olive oil you don’t need extra for dipping your bread. This one came with a Greek Alpha lager on ice in a plastic bag. 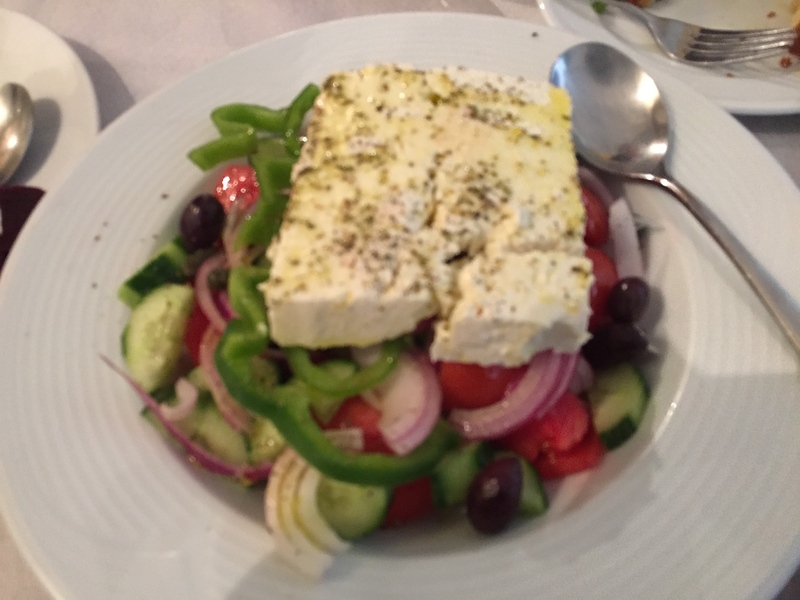 Even an Indian restaurant had a Greek salad of sorts. 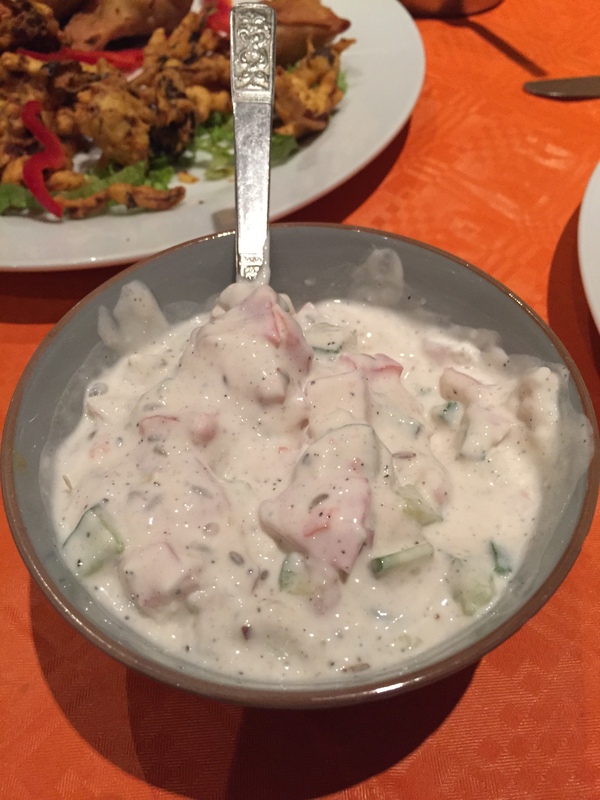 The raita was the chunkiest we’ve ever had, basically a Greek salad drenched in yogurt. 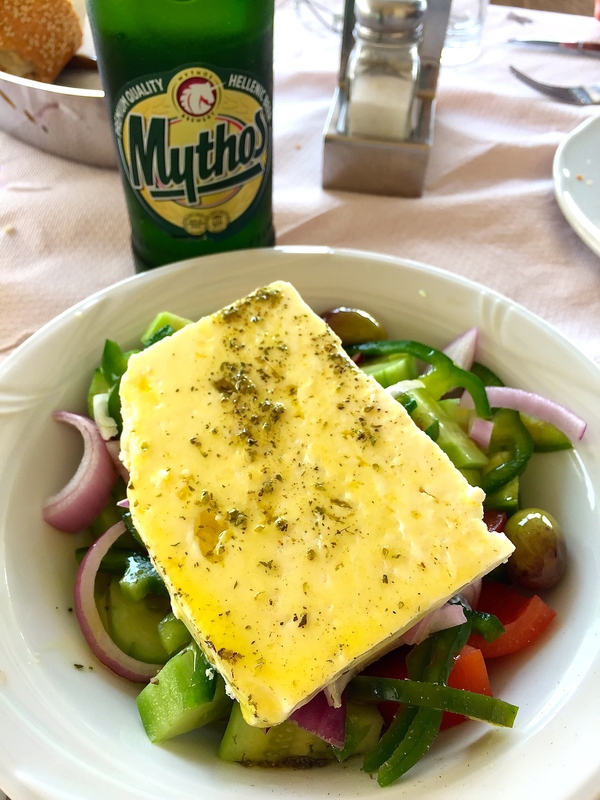 We had the raita with our samosas for dinner and had a legit Greek salad for lunch. The amazing thing about all these salads (besides their exquisite fresh taste) is the price. These were generally about 6 to 7 Euros, so less than $8US. And they were so large, the two of us couldn’t always finish them. Great leftovers for breakfast and then a new salad for dinner. 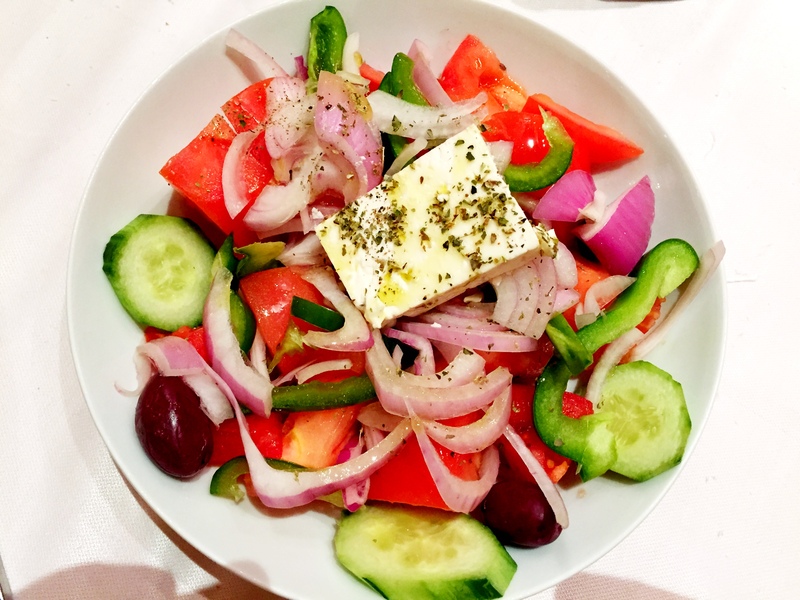 Our very first GREEK salad at the great Lontos restaurant in Thissio (Athens). Cheers! 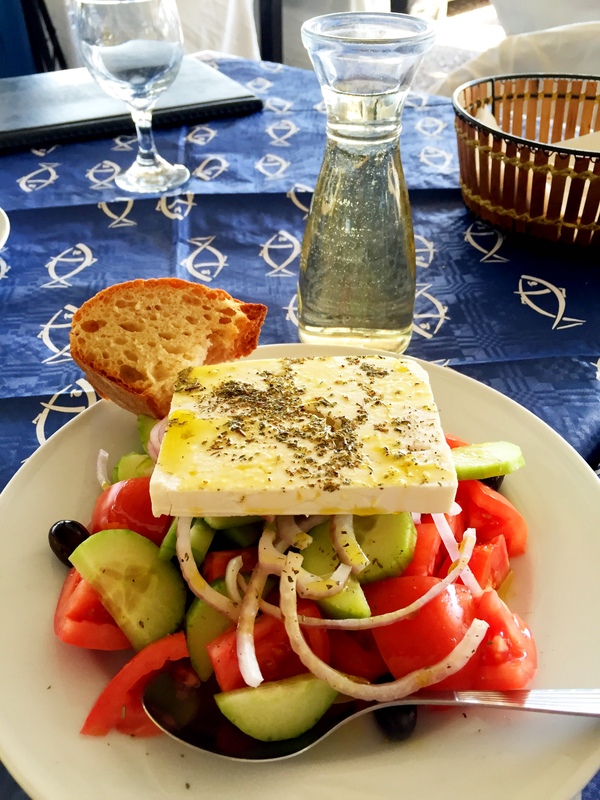 Ten days in Greece and a GREEK salad every day! Off to St. Tropez, France. 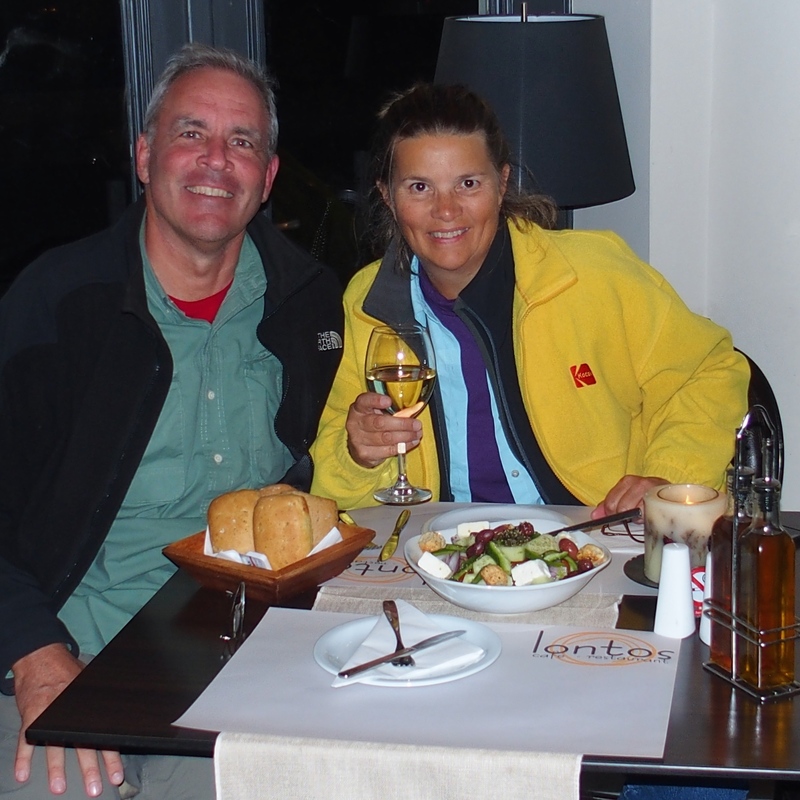 Our first meal was, you guessed it, a GREEK salad, homemade in our apartment in the old town. We brought a little bit of Greece with us to St. Tropez. αντιο σας (goodbye) to Greece. Bonjour a France. 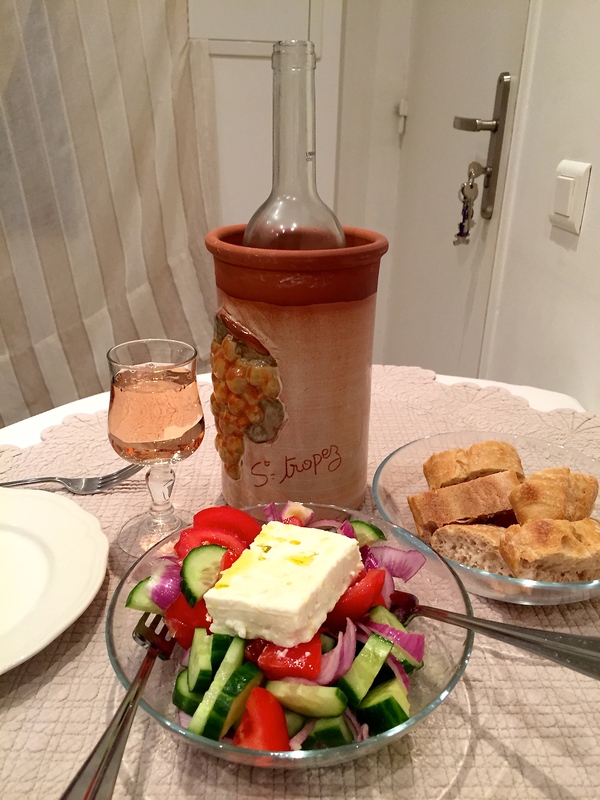 This entry was posted in Smell the Roses and tagged feta cheese, Greece, Greek salad, tomatoes. Bookmark the permalink. 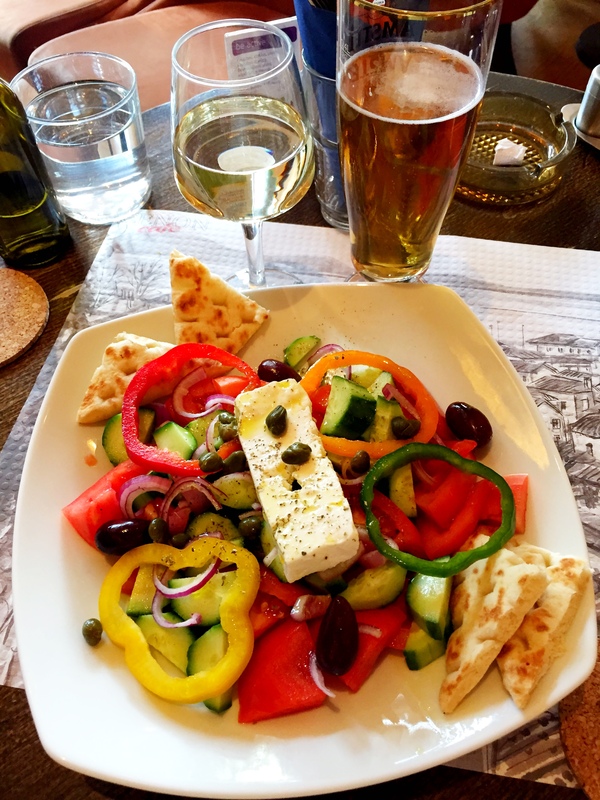 I’ll never think of Greek salads the same way… these look fantastic! I’ll definitely attempt to replicate this authentic version at home. If you have the fresh ingredients it’s one of the easiest salads in the world to make. You don’t have to wash lettuce or mix salad dressing. Just chop, pour (olive oil), and enjoy.